But You Canna Take My Freedom! It’s not often that I find myself pondering a crisis in evangelicalism when it suddenly explodes in front of me. Yesterday I interviewed Jim Henderson from Seattle on his perceptions of what’s been going on with Mark Driscoll and Mars Hill. I was interested in exploring it as an illustration of the tensions between what I’ve called Industry Evangelicalism and Identity Evangelicalism. Having read of the recent uproar among former Mars Hill congregants (who had started a Facebook page called “We are Not Anonymous”) and their planned protests this Sunday, I wanted something of an informed view to help me make sense of what’s happening. We talked about a wide range of things: the tendency to imbue celebrity pastors with extra authority, the sharp distinctions between inside and outside culture, feelings of persecution, special rights for Christian institutions, music, and the weather in the Northwest. I had first become aware of questions at Mars Hill when I read Ruth Graham’s story in Slate about a young man who had been effectively shunned from the congregation. Based on that article, it made me wonder what dynamics were operating in the multi-site organization. That was followed by stories of PR stunts, insensitive tweets that launched twitter wars, the plagiarism charges, and the whole question of the New York Times bestseller that wasn’t. As things have unfolded, Mark Driscoll took some time to reflect and committed to take a break from social media. There have been further stories about the Mars Hill Global Fund and a lingering sense that things may be coming unravelled the more folks tried to maintain the Industry structure. And then there was today. Today the Not Anonymous folks released a 140 page screed that Mark Driscoll had written in 2000. Granted, he was younger then. But the tirades and harsh tones and misogyny are overwhelming. I only made it through the first page when I’d decided I’d had enough. Driscoll had written under the pseudonym William Wallace II. In case you forgot, the original William Wallace was a Scottish warlord leading fights against the power of the English state. The picture to the left is Mel Gibson at his blue-faced angriest from Braveheart. I’m struck with Driscoll’s use of William Wallace and what that suggests about this combative form of evangelicalism. 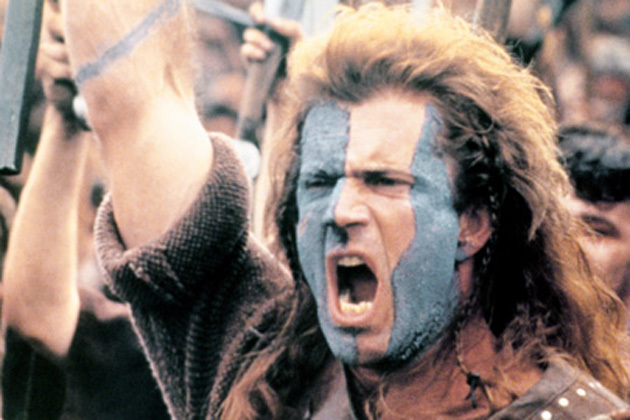 First, Braveheart is a celebration of the Great Man version of leadership. In this model, a charismatic leader is able to mobilize people into doing things the leader believes need to be done. But there is a dark side to this style. Success at leading requires exaggerating the leader’s capabilities while diminishing everyone else’s autonomy. I didn’t know at the time Braveheart came out but it became clear later that the way William Wallace was played was really indicative of Mel Gibson’s ego and personal style. The movie was organized around Gibson and told from that central narrative. Similarly, Driscoll’s angry rants and dismissive tweets serve an organizational style dependent upon that same kind of leadership. As the caption shows, I got the picture of Angry Wallace from a business week article on “Why Self-Awareness is Crucial for Entrepreneurs“. The Facebook quiz on Emotional Intelligence would be really helpful for church planters to make sure that leadership doesn’t come at the cost of shunning others. Third, while William Wallace/Mel Gibson famously shouts “You can take our lives but you canna take our Freedom“, he doesn’t win. He is drawn and quartered. He gets disembowled. True, his last word is “Freedom” but that didn’t make it come about. His actions lead to a movement that brings about a free Scotland. But Scotland is still part of Great Britain. At the end of the day, the sacrifice of William Wallace may cause more damage than was worth it (I really did like the movie, but it’s not real life.) Mark Driscoll may represent the most aggressive arm of evangelical culture wars but in the long run he will make it that much harder for Christians who are attempting to find a path forward in a Post-Christian culture.